Today we’re taking a look at the Cloudlifter – I’ve been wanting to try one of these for years, but haven’t had the chance. I have heard from many people that although initially the Cloudlifters were specifically designed to get a little extra “umph” out of ribbon mics, they’re also really good on SM57s! 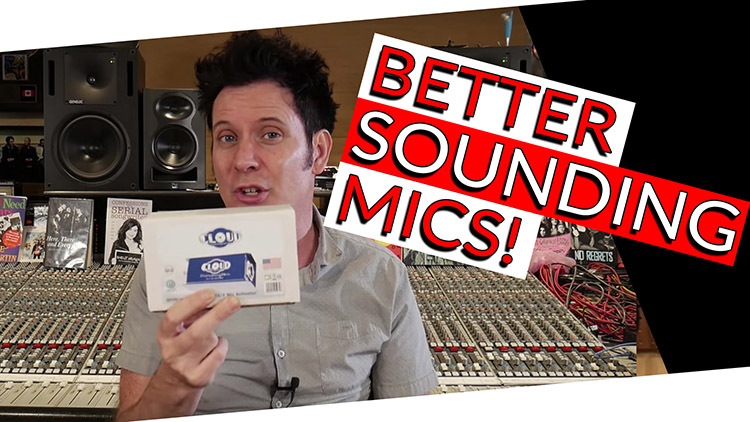 – In one of our earlier videos we went to Simon Phillips’ old studio and he was using these on his SM57s! If you haven’t tried one of these out yet, you’re in luck! The fine folks over at Cloud Microphones have given us 2 Cloudlifters to give away! Please make sure to enter the giveaway above! To see what the Cloudlifter can do, we’re going to try it out using a trusty Royer R-10 Ribbon Micrphone and of course an SM57! We’re going to show you what these mics sound like with/without the Cloudlifter. If you’re looking for a more technical review, our very good friend Matt McGlynn did an in-depth review of the Cloudlifter that you can read here. Please continue reading for more information about the Cloud Microphones Cloudlifter. Provides up to +25dB of ultra-clean gain in two distinct stages and optimal impedance loading for dynamic and ribbon mics to perform their best. Simply connect your dynamic or ribbon mic to the input and connect a mixer or preamp to the output. The Cloudlifter does the rest. ​Turns Phantom Power into gain and clarity without passing it through to your delicate ribbon mic. ​The Cloudlifter allows you to cut through the mix on stage with increased gain before feedback. Cloudlifters are an essential tool for any audio scenario. Recording into a DAW interface, performing live on stage, producing a podcast, using long cable runs in the studio, miking soft sound sources and using noisy or low gain preamps are just a few of its many uses​.